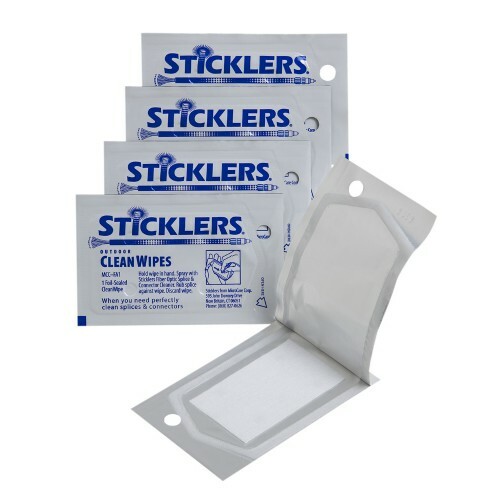 Sticklers™ Outdoor CleanWipes™ are the only wipes on the market engineered for fast, reliable cleaning in harsh environments. They have been designed to stay clean and dry until the package is opened, which is ideal for convenient and consistent cleaning of fiber networks anywhere, any time — even in rain, snow, dust and winds. Each lint-free wipe is packaged in a hermetically sealed, contamination-proof packet that is opened just before use, so cleaning is fast and efficient. Each wipe is made from a field-proven, lint-free polyester fabric that resists shredding, even on LC end-faces. The wipes contain no cellulose, glues or bleaches which might contaminate surfaces. And the foil package protects both the wipe and the user from the solvents, eliminating the need for gloves or finger cots. Each wipe can clean up to six connector end-faces. 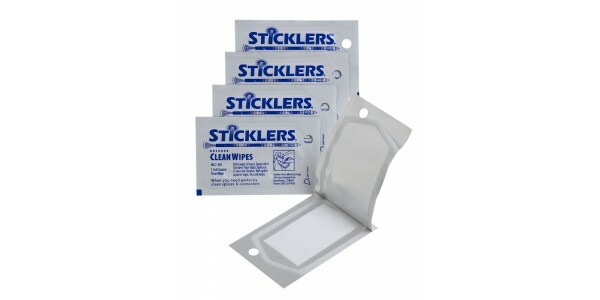 Each package has a convenient “button-hole” so the wipes can be attached directly to cables, accessories or equipment.